MCT is keen to encourage wild-life diversity on the Mayfields site. 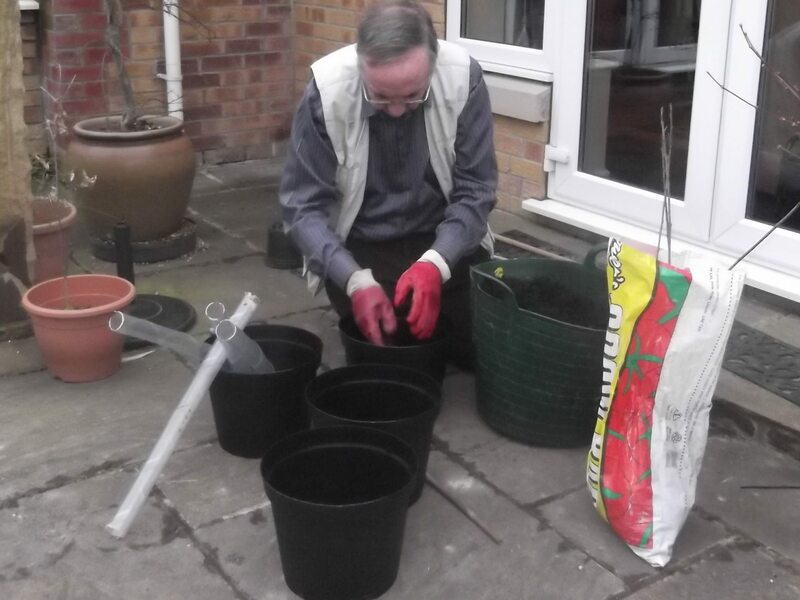 At the end of February we were given 4 young native Buckthorn alder trees from the Yorkshire branch of Butterfly Conservation by Mark Tyszka of Friends of Hob Moor. The field work co-ordinator has planted these temporarily in 10-litre pots of compost to help them develop healthy root systems. 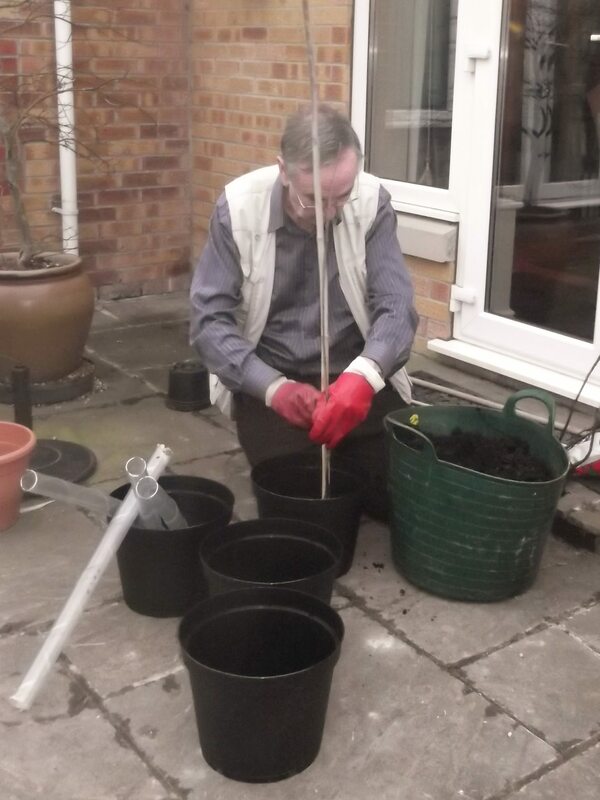 They will be planted out on the site at suitable points later in the year, along with their supporting stakes and transparent protective tubes. The leaves should encourage breeding of Brimstone butterflies. 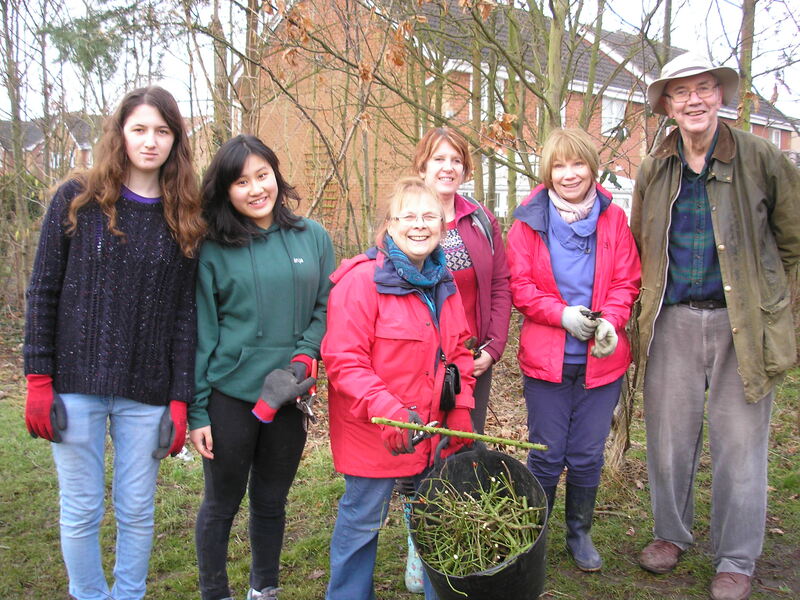 Our 6 volunteers on February 22nd were cool but stayed dry at our regular Sunday morning session. We tackled trimming the roses beside the gate that have been rambling into the children’s playground over the past year and choking a couple of adjacent trees, including a nice young silver birch. Malcolm and Dave Moore trimmed more of these on the following Wednesday afternoon, but there are still more that need attention. Temporarily the area looks a little bare as Pam’s photos show, but Spring’s not far away as some of the English bluebells MCT planted last year are already starting to re-emerge there. Turnout at our Sunday Volunteer session on February 15th was excellent (at 8). As Pam’s shots below show, on the warmest day to date they enjoyed trimming back the massively overgrown rambling roses that were starting to damage other trees west of the path. 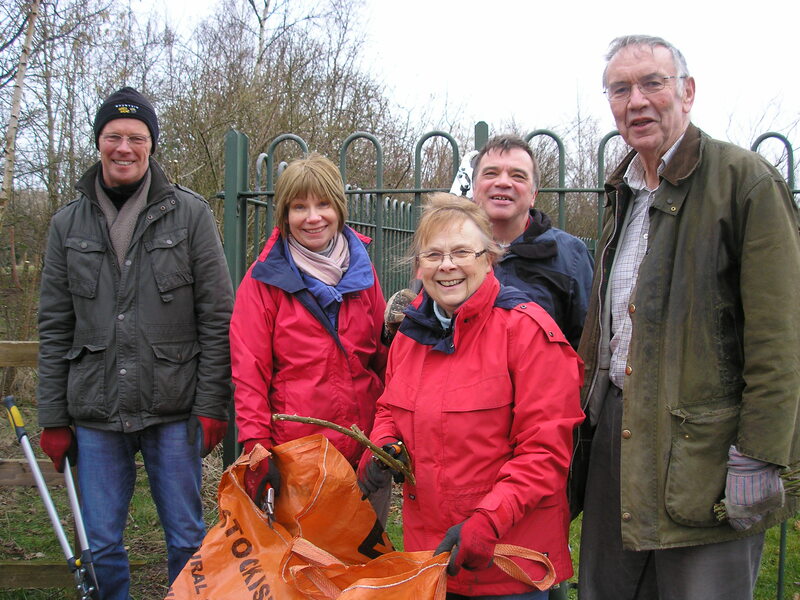 Four volunteers turned out to enjoy the glorious sunshine at our Sunday volunteer session on February 8th. They spent time happily cutting up material cleared from the path and area just west of the path near the gate for composting. 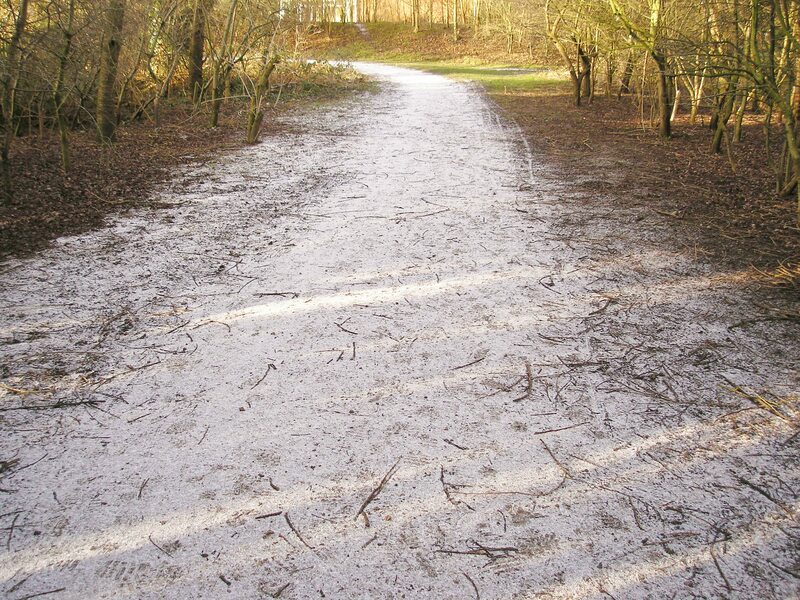 We have been spared a lot of snow on the site so far in 2015, but Pam did manage to catch a light sprinkling on the path a couple of days ago. 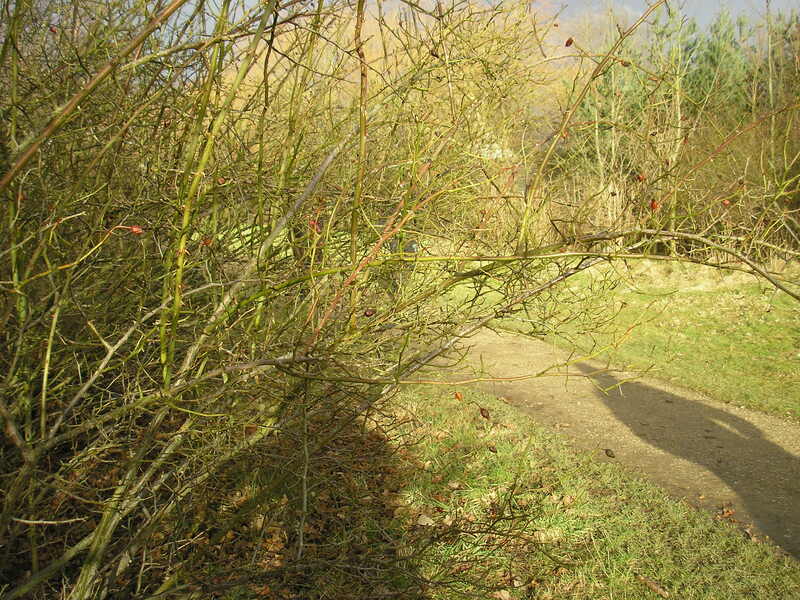 It’s a useful image for showing all the twiggy material on the path that we have recently been clearing away. 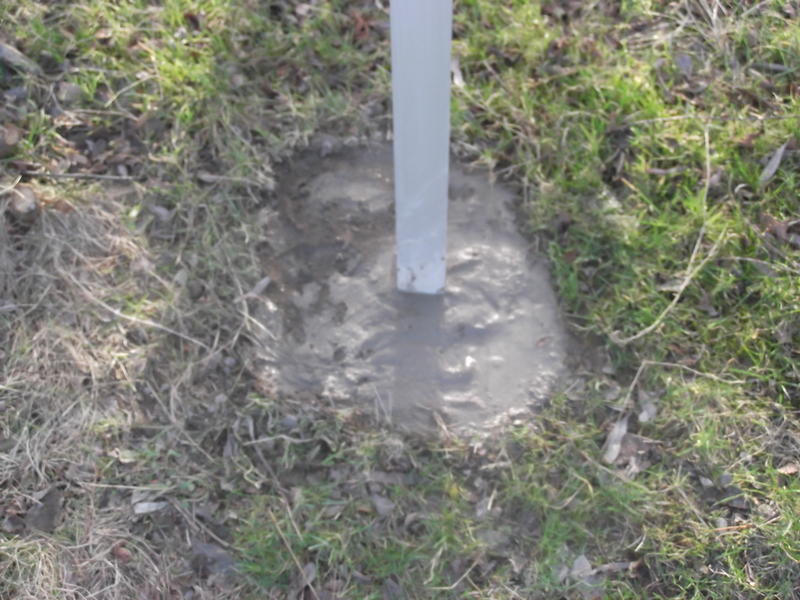 If we didn’t do this at intervals it would soon get churned up by path users to form a muddy humus layer. 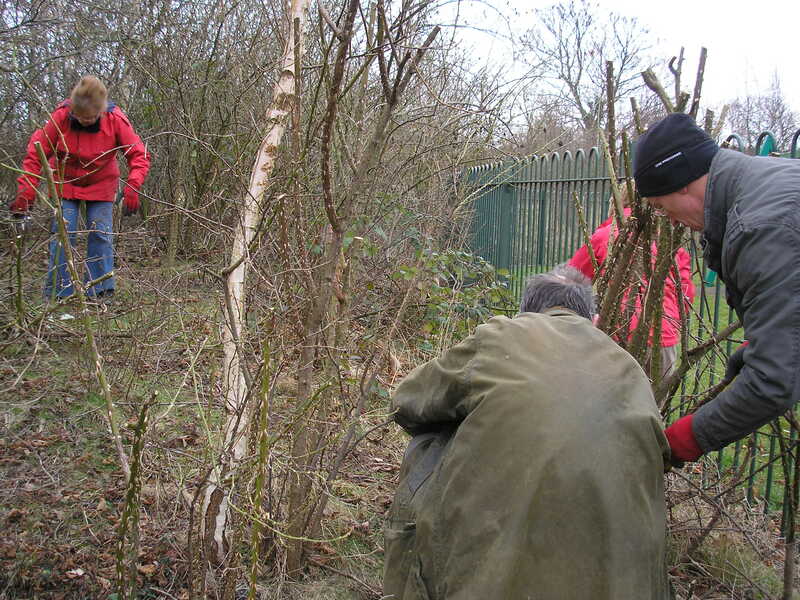 Dave Moore, Mike Ridealgh and Malcolm did more pruning on an over-grown area west of the path near the gate on Wednesday 4th February. They trimmed down the brambles and pruned a Guelder rose so that they could remove 2 dead Alders and 1 heavily leaning Alder to make more room (light, nutrients and water) for adjacent Scots Pine and Oak trees. 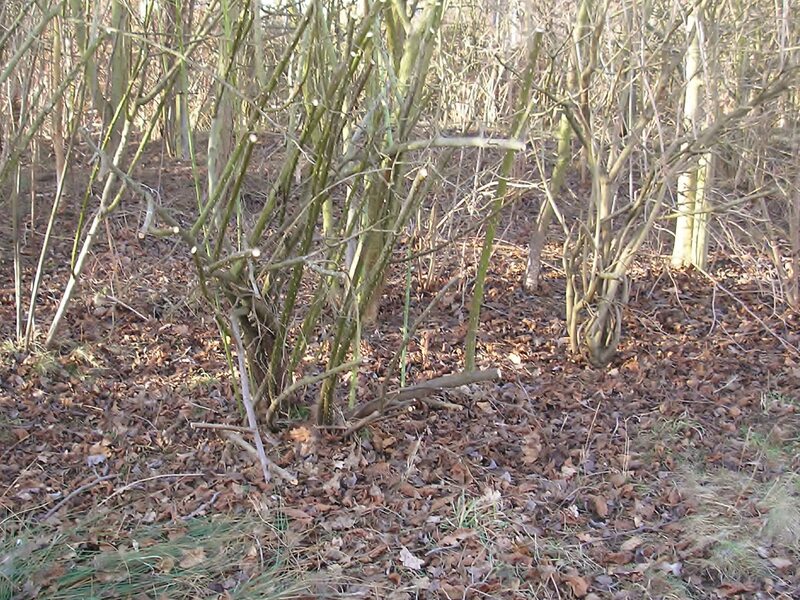 The Guelder rose and live Alder should regenerate rapidly as shrubs as it starts to warm up in spring. Roses on that part of the site are already showing green shoots. Malcolm went back the following day to clear the residue from the adjacent path. MCT has just received its second information board from the Notice Board Company. 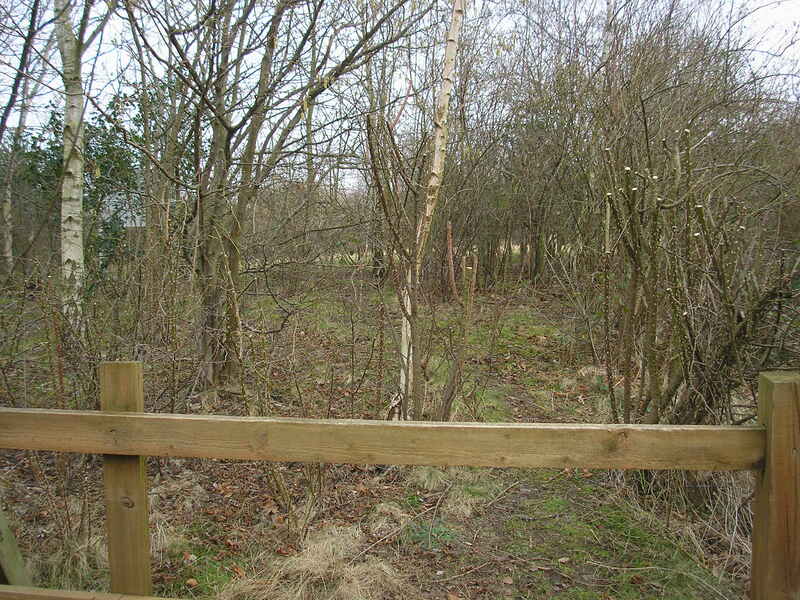 It will be similar to the one near Nelsons Lane, but at the Little Hob Moor end of the site and with extra information about the site ecology. We are grateful to the Dringhouses and Woodthorpe Ward Committee for covering most of the cost, to the Notice Board Company for a helpful discount to keep us within budget, and to local MCT supporters for help in covering installation costs. 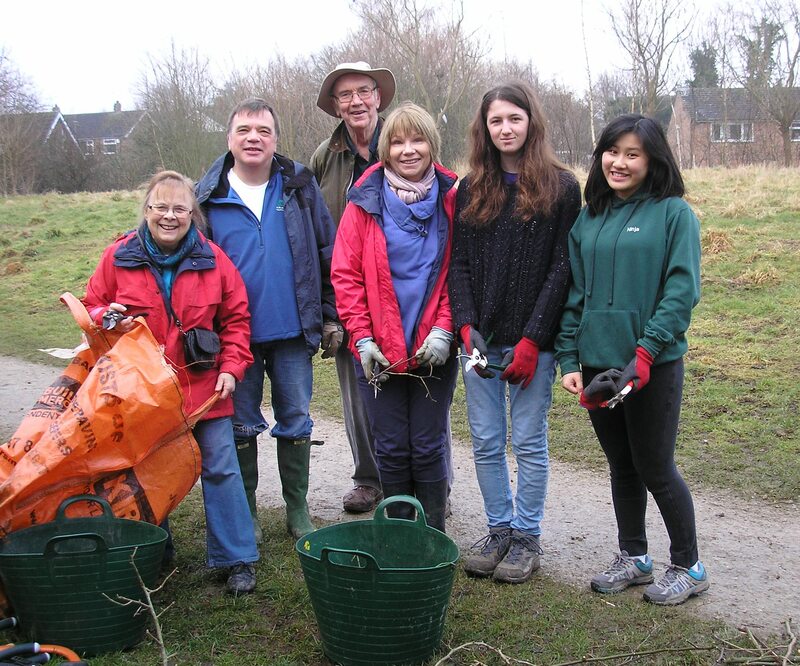 Our regular field work volunteer days started again on 1st February. 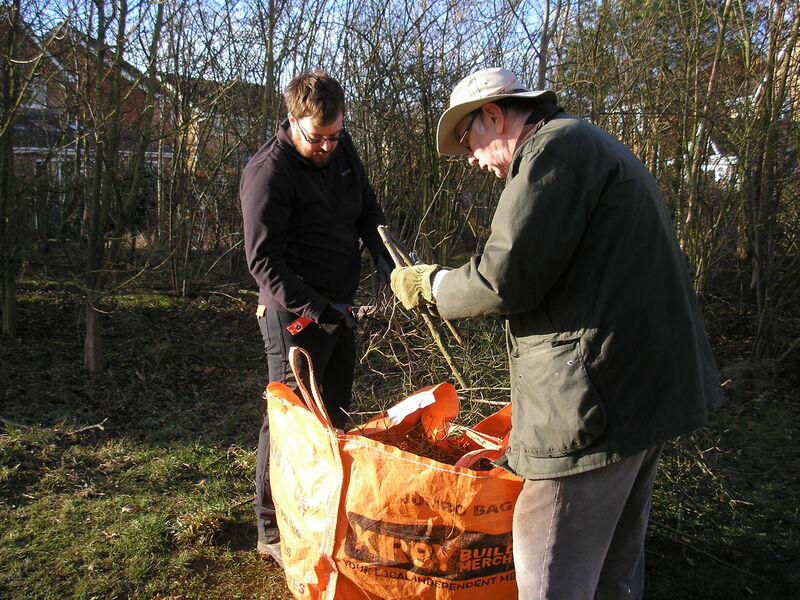 Three volunteers enjoyed the winter sunshine to continue with pruning overgrown roses and composting the off-cut material. This followed from the previous Wednesday afternoon when 4 MCT volunteers took advantage of a sunny break between showers (when the temperature soared to +3 degrees C!) to start pruning the severely overgrown roses by the path edge. Pam caught Dave and Malcolm (below) cutting up the pruned material ready for composting on site. Regular blog visitors may have noticed that we deleted out “New Year Good Wishes” and “Seasons Greetings from MCT” cards to save space. 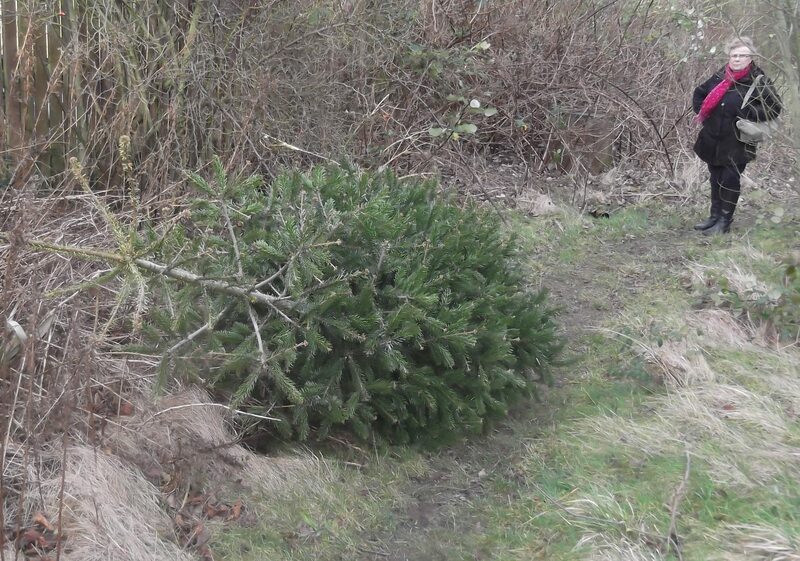 The down side of twelth night is that some locals still think it’s OK to dump their old Xmas tree on the Mayfields site rather than use the special dedicated Council green bin collection – the tree below was across the back path alongside two empty wine bottles! On the positive side, this time last year we had to dispose of 3 such trees. 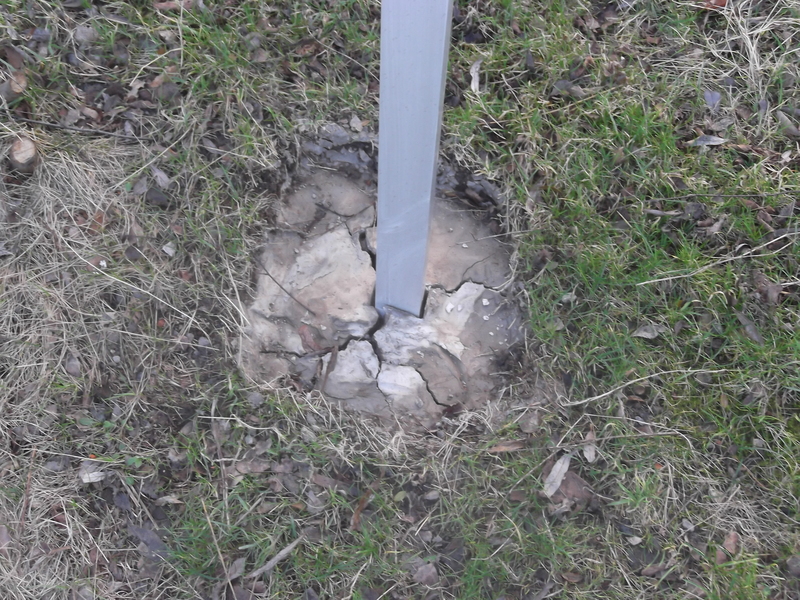 Meanwhile, when checking the site for damage possibly arising from the recent strong winds and/or heavy frosts, we noticed cracks at the surface of the concrete used to hold the information board in place. Chipping away the surface showed these were not deep, so the loosened material was replaced by fresh concrete to minimize future water penetration and freeze/thaw damage. 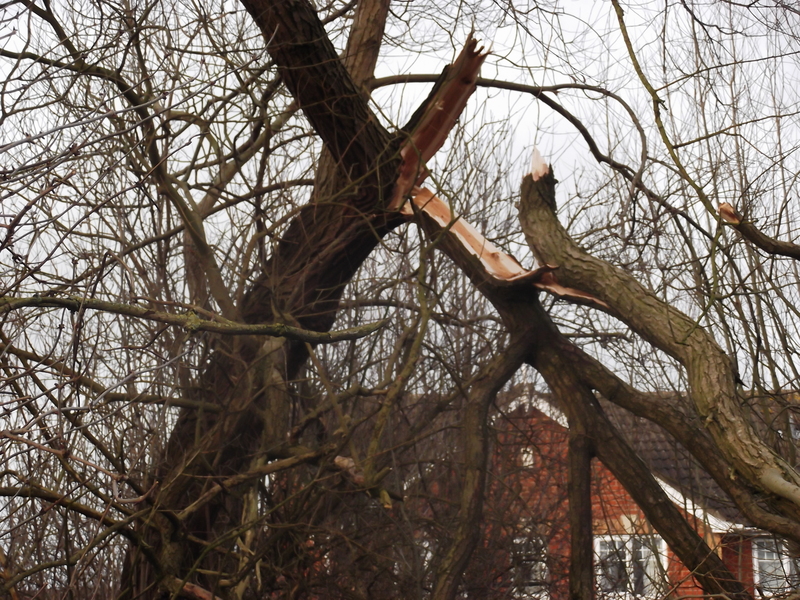 The wind did bring down a substantial crack willow branch south of Nelsons Lane, but the Friends of the Railway Pond and Mayfields Reserve have done a good job there making sure risks to path users are negligible. 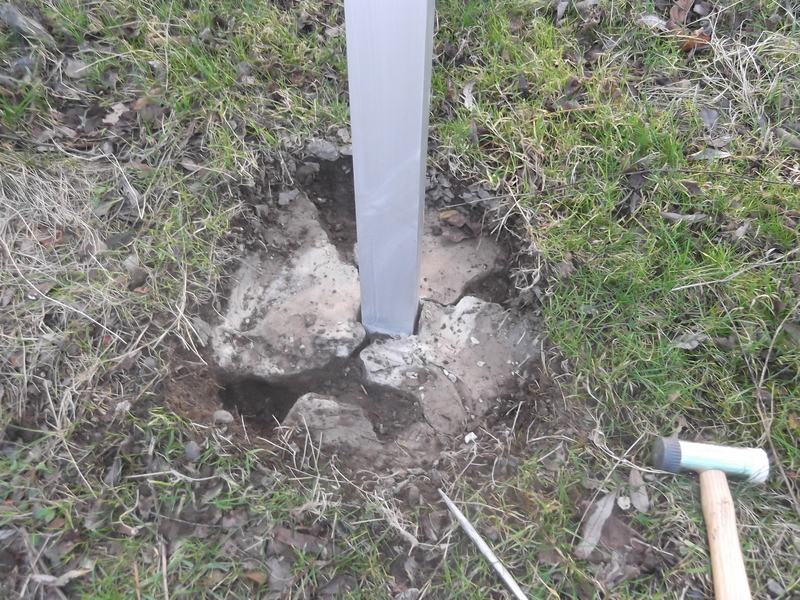 We also noticed that a bolt and one of the springs had been taken from the gate post to prevent bit closing automatically as a safety measure. We would be grateful to receive any information if anyone knows who removed it.